I'm Mike Romo and I am the product manager for Norton AntiVirus 12 for Mac and Norton Internet Security 5 for Mac. I am really excited to get this opportunity to welcome you to our beta program and want to be the first to thank you for your interest in our latest products. - First, these products are specifically designed for MacOS X 10.7, "Lion". We have re-engineered the products to take advantage of the many "under-the-hood" improvements with the latest operating system and so far, I am really happy with the performance gains we're seeing. Unfortunately, the changes we had to make made it impossible for us to support previous versions of MacOS — for Mac users who do not have Mac OS X 10.7 installed, we will be including Norton AntiVirus 11 and Norton Internet Security 4 for Mac on our installer disk images. - Second, we are integrating with the same licensing infrastructure that our Windows products use. This allows us to make renewals and upgrades a much smoother experience, and will eventually allow us to offer a blend of both Mac and Windows products, in a various seat counts, which I know a lot of users have been wanting for awhile. Users will be able to manage all of the Norton product licenses from a single web page as well. I have a lot of plans for the product line that can finally be realized now that we have licensing — but we'll talk about that later. Now let's get down to the nitty gritty. What are the new features? The most obvious change is our new look and feel, which echoes the design and feel from our award winning Norton Internet Security product for Windows. Don't worry! This is a Mac application through and through. We just wanted to provide some consistency between the two product lines. I think the new iconography (and related functionality) makes for a much easier user experience and I am really looking forward to reading what you think. 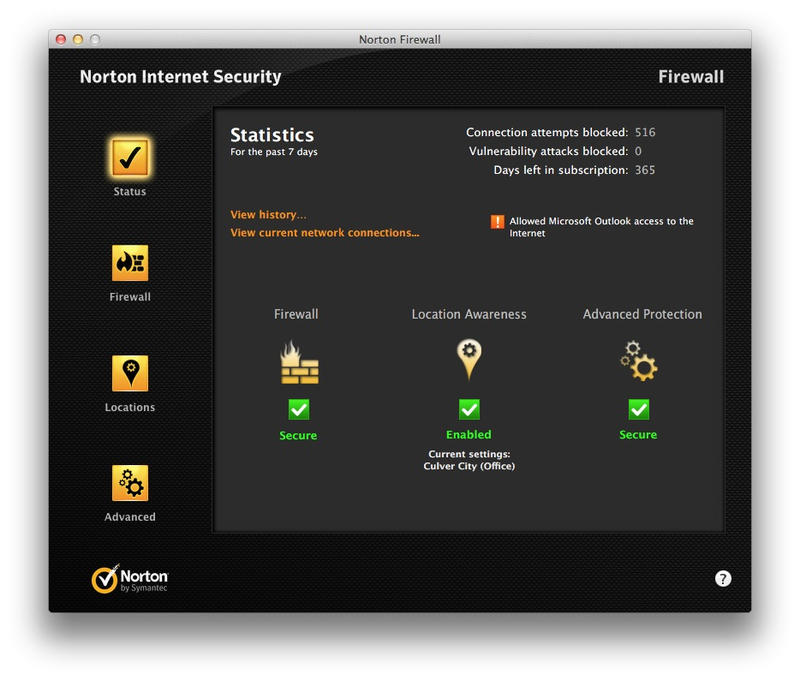 We have added Norton SafeWeb to our browser toolbar. In addition to offering a new "Safe Search" toolbar that provides at-a-glance security profiles for your search results, we provide visual feedback on any web search you do to tell you whether or not a website is safe and secure. This builds on our phishing protection, which scans and analyzes web pages for threats, and lets you know when a website is safe, not only in terms of computer threats, but if the site has any issues with Ecommerce and identity threats. We'll even let you know if the site's email and other communications practices are annoying or not! 1 - Mount Scan - While scanning drives and CDs when connected to your Mac might have made sense a few years ago, it just doesn't make sense when thumb drives are 32GB and hard drives over 2TB are so inexpensive. Now, when you hook up a new hard drive, insert a CD/DVD or mount a thumb drive, we scan the files when you open them. You can, of course, run a system or manual scan in Norton AntiVirus to scan the entire hard drive. When you copy the file over to your main drive, Auto-protect will scan the file before it's written — but when you open a document from the mounted drive, we'll scan it on the fly. 2 - Confidential Data Protection - We have removed this feature; it didn't work with HTTPS sites (since the data being passed was encrypted), and we wanted to focus improving other features we knew customers were using more often. 3 - Idletime scanning - No more scheduled scans! We now scan for threats while the machine is not being used. You can still do scheduled scans using Applescript or using your own custom scripts using the "navx" command. 4 - Faster Installation - Instead of waiting to download the new definition and signature updates during install, we now download them in the background after your Mac restarts, which results in a much faster install experience. There are quite a few tweaks and improvements to discuss, but I have a feeling this post is already long enough. I will post more entries to answer your questions and explore the features in depth, including how to operate the products using the command line, and tips on optimizing Auto-protect for specific kinds of Macs. Everyone on the Mac team is really excited to collaborate with you to help make these new releases our best ever, and welcome your ideas to make them ever better. As always, if you want to contact me directly, email me at mike_romo@symantec.com. Whats up with Norton?????????????? I get message saying my internet security is expired - NOT SO - paid up til 2014. I sent in for callback several days ago - NO RESPONSE. Norton has taken down their callin #. HERE I SIT WITH NO INTERNET SECURITY THAT IS ALREADY PAID FOR. IS NORTON STILL IN BUSINESS????????????? Does this product protect against CryptoLocker? If not, does any of the Norton protect against this form of Malware?